This article was first published in the Times on 26 July 2014. Earlier this year a Catholic, a Lutheran and two Anglicans moved into Lambeth Palace. Their job, unlike most of the Palace staff, is not to prepare briefings or arrange meetings but to pray. Their arrival was hailed by the Archbishop of Canterbury, the Most Rev Justin Welby, as a “profound step” on the road to Christian unity. The group are from Chemin Neuf (“New Way”), a community started in France in the 1970s. Although Catholic-founded, it has an “ecumenical vocation” in seeking to unite Christians and, in this spirit, its membership is open to people from any denomination. It now has 2,000 members all over the world. I met the four in the palace’s Pink Drawing Room, replete with chandeliers, a huge dining table and an oil painting of Thomas Newton, Bishop of Bristol in the 18th century. The group’s journey to Lambeth Palace began several years ago when Welby, who was then Dean of Liverpool, spoke at a Chemin Neuf conference. Later, he was impressed by a community spirit that drew people of various backgrounds and beliefs together, and asked Father Laurent Fabre, the founder of Chemin Neuf, if he could spare a few of his members for Lambeth. The group is made up of a married Anglican couple, Alan and Ione Morley-Fletcher, a Catholic consecrated sister, Sister Ula Michlowicz, and Oliver Matri, a German Lutheran training to be a pastor. They explain that they live in a tower “with a dungeon at the top”. She describes Chemin Neuf as a mix of the traditional and the new. On the one hand it is rooted in Ignatian spirituality, based on prayers and meditations written by St Ignatius of Loyola, the founder of the Jesuits, in the 16th century. But it has modern, charismatic elements, too: its members clap and sway and sing praise songs, and prayer can involve speaking in tongues. 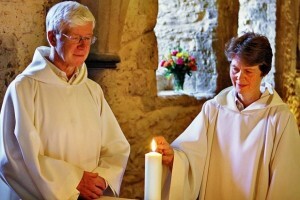 Their day is structured around two prayer services and a Communion service in the Crypt Chapel of Lambeth Palace. As these are Anglican services, Sister Ula also goes separately to Mass twice a week at Westminster Cathedral; being Catholic she is not supposed to go up for Anglican Communion. She says she does not want to “make a big speech about it”. She explains: “It’s very new. It’s just been one month.” But it is “not easy every day”, she says. As well as helping with prayer, the community is meant to be a hospitable presence for guests and for Lambeth officials rushing around trying to meet deadlines. The Rev Dr Jo Wells, the archbishop’s chaplain, says they remind staff that “life is not just about ticking off tasks — that we have a more ultimate purpose”. They add a “gentleness” to the system, she says. The group also spends an hour a day in silent prayer, which allows staff to join in for short periods. “I can drop in for three minutes of it and the archbishop will dive in and out,” Dr Wells says.